Like it or not, road riding is a necessity for many of us whether it’s to get us from one farm to another, from our farm or stable to a trail, or because the road itself forms one section of an equestrian trail. Horses are big, powerful animals, but cars and trucks are even bigger and more powerful. What can we do to help ensure the safety of our horses and ourselves while sharing the road with motorized vehicles? The Horse Council BC Zone Representatives in Prince George, BC, in cooperation with Shaw Community TV, produced a video that provides tips for both horseback riders and motorists on how to increase safety when horses are ridden on public roads. 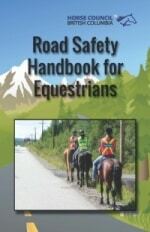 Horse Council BC has produced a Road Safety Handbook booklet for Equestrians and Caution! Horses information rack cards. Each contain important information about road riding and tips to help keep riders safe. You can order the booklets and rack cards through the Horse Council BC office by calling 604-856-4304 or 1-800-345-8055, or by e-mailing [email protected] The cards are also available at ICBC insurance broker offices across the province. Horse Council BC carries a number of safety products in our store, from signs to wearables. To purchase any of our safety items you can call our office at 604-856-4304 or 1-800-345-8055 or you can order through our online store. Enjoy your ride, and stay safe! Bowen Island Horse Owners & Riders Association (BIHORA) mounted a Spring Road Safety Campaign in 2010. They’ve graciously shared information on their campaign with other Horse Council BC members. View a summary of their Spring Road Safety Campaign, the press release they issued to local media, and an informative poster that they’ve placed at trailheads around Bowen Island. Great work, BIHORA! You can publicize road safety for horses on the roads by submitting a similar article to your community newspaper. HCBC has some sample press releases that you can adapt to your area. Check out this article submitted to the Comox Valley Record by local Back Country Horsemen of BC members in March 2011.